Powers/Abilities: Prior to his depowerment, Maximus Lobo could shift into a large lupine form that had enhanced superhuman strength (lifting 5 tons), stamina, durability and agility. His hands shifted into massive claws easily capable of rending flesh and his powerful jaws could achieve similar feats. Lobo claims his bones are as durable as Adamantium and he has proved capable of withstanding Wolverine's claws. His senses were akin to that of a wolf, effortlessly tracing people by picking up their scent. As a wolfpack leader, Lobo was recognizable thanks to a white stripe that ran vertically along his forehead. His natural, intimidating pheromones could spark violent tendencies in other feral mutants. Lobo believed in the supremacy of homo superior and had no trouble killing humans and mutants who sympathized with homo sapiens. Depowered, he still retains his considerable business acumen. (Uncanny X-Men I#417 (fb) - BTS) - Born homo superior, Maximus Lobo was a member of the "lupine family", a number of mutants who shared remarkably similar genetic mutations. In the case of Lobo, he found he was able to transform into a furry creature resembling a werewolf. He began to quietly gather a number of similarly gifted mutants to his side, calling this pack "Dominant Species" because he genuinely believed that even among other mutants they were truly homo superior. Lobo even has started his own successful business: Lobo Technologies. (Uncanny X-Men I#417 (fb) - BTS) - That company was eventually bought by Worthington Industries and became a wholly owned subsidiary with Lobo still in charge, complete with a headquarters in White Plains, New York. (Uncanny X-Men I#420 (fb) - BTS) - Eager to make a profit, Lobo began to sell Stark Tech as Lobo Enterprises products, specifically technology intended for weapons. This wasn't allowed by the contract Worthington had signed with Stark, but Lobo figured that if they got caught it would be Warren to take the fall for this. (Uncanny X-Men I#417 (fb) - BTS) - Eventually, Lobo got fed up with waiting around for homo sapiens to die out. When humanity showed no immediate signs of becoming extinct, he decided to help along evolution by killing humans. (Exiles I#28 (fb) - BTS) - Lobo became allies with Burt Worthington, the supervillain Dazzler and also the disgraced, imprisoned uncle of his boss Warren Worthington III. They frequently shared information about experiments in genetic experimentation. (Uncanny X-Men I#417) - Lobo and his men were in New York City where they ran across a mob of humans stalking David and his mutant girlfriend Mandy. Transforming into his werewolf form, Lobo first massacred the mob. He then turned his attention to the couple, disgusted by the fact Mandy was "dating beneath her species". He slaughtered David right before her eyes. After leaving the message "Homo-Superior is rising!" on a nearby wall, they departed. (Uncanny X-Men I#417 - BTS) - The brutal deaths were investigated by police detective Charlotte Jones who, taking the homo superior message as a hint, decided to contact her old lover Archangel who agreed to come by with the X-Men. Thanks to Wolverine, they quickly picked up a scent they traced back to the Lobo Industries building. The X-Men were stunned to find out their teammate Warren actually owned the company, a fact the high flying Angel wasn't even aware of himself. (Uncanny X-Men I#417) - As if on cue, Lobo presented himself to the surprised team. (Uncanny X-Men I#418 - BTS) - Joined by other members of his lupine pack, Lobo attacked the X-Men and managed to defeat Wolverine within 5 minutes. (Uncanny X-Men I#418) - Archangel ordered Northstar to return Wolverine to the mansion for medical assistance while he and Husk were the only ones left to oppose Lobo's horde. (Uncanny X-Men I#418) - Lobo and his men were able to hurt Husk even in her most defensive, iron form. While the girl was slowly bleeding to death, Lobo engaged Archangel in a philosophical discussion about homo superior and the right to lash out against others. Lobo assured Worthington that Darwin's evolution theory would prove that his lupine mutants were the truly superior specimens of mutantkind instead. Before he could make good on his threats, Lobo watched as Angel grabbed Husk and flew off with her. (Uncanny X-Men I#419 - BTS) - Tired and hurt, Archangel was forced to land in the woods near White Plains. There, he tried his best to take care of Husk even as Lobo and his men began to hunt them down. Eventually, they caught up with the two X-Men and attacked, taking down Archangel and leaving Husk only moments to signal the X-Men for help. (Uncanny X-Men I#420) - Archangel continued to fight Lobo and his wolves, even surprising himself by revealing he was in fact Maximus' boss Warren Worthington III. Lobo then also stunned the hero when he claimed his father was much easier to kill even as two of his wolfpack bit the X-Man in the shoulders (see comments). The wounded Archangel nevertheless managed to grab Husk away from Lobo's men and took off with her, though his injuries and the wolves' pursuit forced him to return to Lobo Industries. Briefly hiding out in the company's storage area, he not only realized his blood had somehow gained regenerative properties, the supplies being kept there were actually repurposed Stark weapons tech. Not too long after that, Lobo and his men arrived to finish their fight. The sneering Lobo took the time to explain why he was selling pirated Stark Tech, wasting a precious window of opportunity until the X-Men arrived to rescue their teammates. Lobo briefly fought Juggernaut. When he found himself overpowered, Maximus wasted no time to rig the nearby fuel storage tanks to explode. Using the inevitable explosion to cover his tracks, Lobo successfully escaped. (Exiles I#28) - Maximus Lobo and his Dominant Species wolfpack stayed close to the Xavier Institute. Eventually, they became aware of another lupine mutant, the young teen Wolf Cub. Using his natural dominance, Lobo started to influence the teen, increasing his violent tendencies. At the same time, the interdimensional band of mutants known as the Exiles were made aware of the fact the Alex Summers residing on Earth-616 harbored an evil, alternate reality counterpart inside him primed to take over his body given the slightest weakness or injury. When he did, it would mean the death of Wolf Cub, his friend Carter Ghazhikanian and his mother Annie. The team made preparations to intervene. Not too long afterwards, Lobo's influence on the Cub became clear when the teen was out on the Institute grounds playing ball with Juggernaut, Carter and Havok. Suddenly overcome by rage, Wolf Cub disembowled Havok who was rushed into the X-Men's medical bay just as the Exiles arrived. Havok's injuries allowed his evil counterpart to gain control, which the Exiles knew but Annie and the X-Men refused to let them take Carter and the boys to safety. 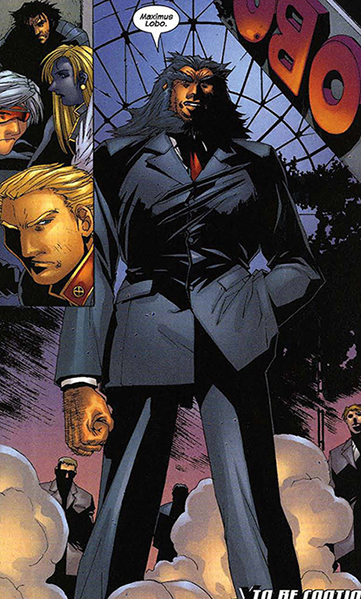 When "Havok" revived, he immediately tried to kill Carter. Mimic got the boy clear, but a stray plasma strand still hit the child, knocking him out. Juggernaut grabbed Carter and got clear of the school, moving on to the grounds with Annie, Husk, Morph, Nocturne and Wolverine. While Annie and Juggernaut kept Carter safe, the others found they were being stalked by Maximus Lobo and his wolfpack, led there by Wolf Cub. (Exiles I#28 - BTS) - Eager to find out more about Lobo's alleged connection to his uncle Burt, Angel took Iceman to search the ruins of Lobo Technologies. To his shock, he discovered partially burned correspondence between Lobo and Burt concerning genetic experiments. Lobo shocked Archangel by suddenly sending him a message through his X-uniform's communicator, telling him he was about to kill Husk. Before he could respond, Exiles members Magik and Sunfire teleported in with the belligerent Illyana ready to cut Warren for his regenerative blood if he didn't comply. (Exiles I#29) - Lobo gloated at Wolverine, Husk and Morph while his men gathered around him, ready to attack. When they pounced, Wolverine took on Lobo, ordering Husk to get Wolf Cub out of there. So afraid of the wolves since her last encounter, Husk was unable to face them again. Lobo however, showed to Wolverine that his bones were more than a match for the mutant's Adamantium claws. In the fight that followed, Morph was ripped to shreds and Wolverine and Husk were injured and knocked unconscious. Still feeling some kind of connection to his fellow X-Men, Wolf Cub convinced Lobo to not kill them but instead use them as hostages while they went after Archangel and the other members of the school. Agreeing to this, Lobo took his men to hunt for Nightcrawler and Juggernaut who had gone off to get Carter Ghazikhanian to the nearest hospital. Lobo and his men caught up with them about halfway through their 40 mile car ride. Lobo's henchmen caused the car to crash, lunging at Annie and Carter though Nightcrawler teleported them to safety. Their fight was interrupted by the evil Havok who blasted the wolves away. Havok was suitably annoyed he had once again missed his opportunity to kill Carter, though he perked up a bit when the other mutant wolves brought in the captured, defeated Wolverine. (Exiles I#30) - Lobo and his wolves were unable to withstand the combined force of the X-Men and Exiles. With Juggernaut leading the charge, Maximus and his lycans were beaten back and forced to retreat, leaving the heroes to deal with the still-possessed Havok all alone. Wolf Cub was apparently released from Lobo's influence. (House of M I#8 - BTS) - Maximus was among the many millions of homo superior who lost their powers when a reality altering spell cast by the Scarlet Witch reduced the number of gene active mutants to a mere 300 worldwide. (Young X-Men I#1 (fb) - BTS) - After waking up powerless, Lobo decided it might be for the best if he went into hiding from his many enemies. He moved to the town of Erfurt, Germany. (New Avengers I#17 - BTS) - Lobo's mutant energies joined with those of the other depowered mutants, creating the Collective, a massive force presence that ended up killing, among others, most of the members of the Canadian superhero team Alpha Flight. (New Avengers I#18 - BTS) - SHIELD analyzed the Collective's multiple energy signatures and managed to identify Lobo's, along with 50+ other victims of M-Day. (Young X-Men I#1) - Lobo was eventually tracked down by Wolf Cub who traveled to Erfurt eager to have his revenge. 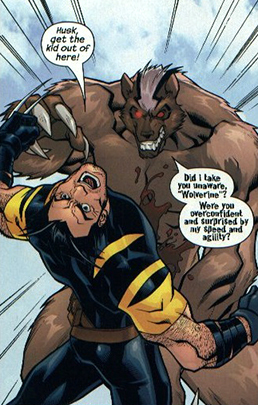 Changing into his wolf form, Gleason took joy in intimidating the scared, powerless Lobo who futily tried to explain that all he did was for the good of mutantkind. Before Gleason could kill Lobo, "Cyclops" arrived to offer Wolf Cub a spot on his new X-Men team (in reality, it was a disguised Donald Pierce). (Dark Reign Files#1) - Following Norman Osborn's takeover of SHIELD, he had the living computer Quasimodo compile comprehensive data profiles on all available allies, enemies and possible operatives. Lobo was listed as highly expendable because of his depowerment. Had he retained his powers on M-Day, Quasimodo predicted that Lobo and his Dominant Species clan would have been useful agents. Right now, Lobo was little more than "another failed, corrupt CEO.". Profiling Maximus Lobo is a tad hard to do, and not just because it meant revisiting early 2000s Chuck Austen X-comics...Lobo claims he was responsible for killing Angel's father, Warren Worthington II. That's supposed to mean he was one of the two unidentified mercenaries working for Dazzler in Ka-Zar I#2/2. This was never confirmed officially and seems a tad unlikely. Lobo was established as a brilliant businessman who already ran his own company, possibly even when Warren's dad was still around. Add to that the fact Dazzler explicitly hired down-on-their-luck, unreliable mooks as henchmen. It's hard to imagine an up-and-coming (not to mention human hating) mutant would agree to moonlight as one of Dazzler's cronies. It's more likely Lobo simply alluded to the death of Warren's dad to unnerve Archangel. 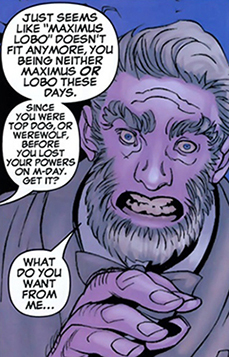 Maximus Lobo received a profile in Marvel Encyclopedia: X-Men.